Then came President Johnson's Great Society and later Medicaid, Medicare, to be followed by Obama Care. Socialism was now fully embedded in the body politic and the votes continued to pour in for Democrats because Conservatives compromised on their principles and allowed it to happen. In the late 1960's, environmentalism raised its ugly head in America with powerful legislation to implement environmental goals. Once environmentalism was legislatively triggered, national and international interests radicalized it. Radical environmentalism was and is now fully indoctrinated into the American psyche, taught in our public schools and colleges and propagandized by national and international governments, environmental groups and corporations. Environmentalism is not a science it is in fact a cult. For the last 80 years the Conservatives have been compromising on all kinds of Liberal causes, from welfare, to finances, to immigration, to health care and the environment. As a result the American population has become ignorant and grown weak and hopelessly dependent on government, believing everything they are told and acting more like puppets instead of proud, independent and self-reliant, free Americans. Millions of Americans are hooked on drugs, alcohol, low-grade entertainment, swearing and debauchery. The "F" word has become ubiquitous and part of every day language. But you say, "Conservatives didn't have a choice, because the Democrats were in control." That's right! And how did the Democrats get in control of the government? They got in control with a diabolical, unconstitutional scheme of promising federal dollars and benefits (your money) to the general population and special interests ..... for votes? If you want something from a Democrat government, they will give it to you by stealing it from someone else under the color of law, and give it to you for free, in exchange for your vote. WE, THE DUMB PEOPLE THAT WE ARE, fell for the Democrat scheme hook, line and sinker. The Democrats, for over 100 years, have violated every principle of freedom, liberty, unalienable rights, individual responsibility and self-reliance that existed under the umbrella of our Constitution. That is why they want the Constitution to be a fluid document instead of the Supreme Law of the Land based on the intent of the Framers. Their goal was and is to manipulate the Constitution for their own political ends to remain in perpetual political power. That is why they are so deathly afraid of a conservative leaning U. S. Supreme Court and will vigorously obstruct any conservative justice nominee. Once Conservatives started "compromising" their principles of individual freedom and less government in favor of the Progressive's collective ideology, the end of America's free Republic became preordained. The division between the Conservative and Liberal ideologies is now so far apart compromise between the two sides has become a distant mirage. 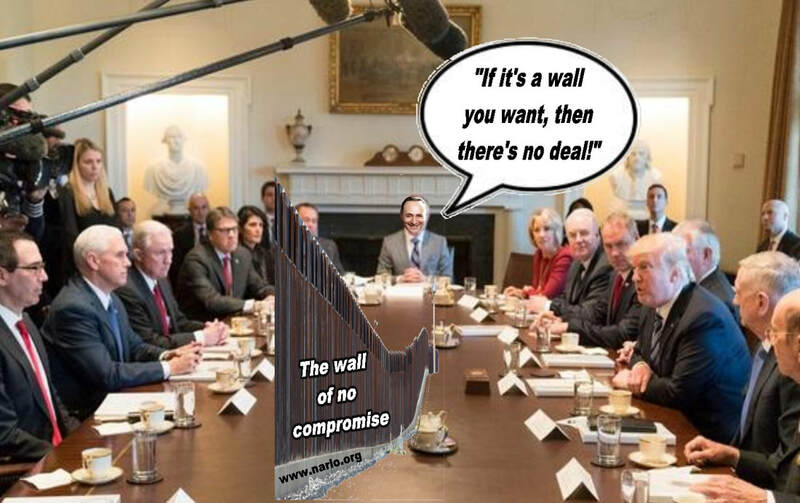 Now, the only "compromise", which is no compromise at all, arrives by virtue of who holds a majority of political power in Congress and the Whitehouse. All the minority party can do is to obstruct the majority party using Congressional procedural rules. With all this in mind, how on earth can the left and right ever come together on issues that are good for America, not just good for the party who holds political power? Are there any national issues where the parties can come together and pass legislation that will benefit the nation as a whole? Only one issue comes to mind and that is the nation's infrastructure. But "Business Insider" estimates that to repair our roads, bridges, railroads and our seaports will take $3.2 Trillion, with $1 Trillion needed immediately. Where is the money going to come from, even with a vibrant and growing economy? America is flat broke and deep in debt because politicians refuse to compromise for the benefit of the nation. Why, because way too much of the available tax money is being and has been used for entitlements to buy votes? Now it can't be undone because the "people" have been bought off and will vote to maintain their "free stuff." The American government (that's your Congressional representatives) has committed one of the most unforgivable management sins. It engaged in "deferred maintenance" of our infrastructure and we are now paying the price. Except government politicians and bureaucrats never pay the price. Only the American taxpayer pays the price for government mismanagement, corruption and over regulation. So what are the issues that the left and right are unable to find a compromise? There are many. The two sides are deadlocked on immigration and border security. The Conservatives want a wall, repeal or limitations on family-based immigration and elimination of the diversity visa lottery. Inexplicably, Conservatives want amnesty for 1.8 million Dreamer (DACA) immigrants. But more amnesty will only encourage more illegal immigration. President Reagan already did this and the results have been and are open borders and the unstoppable flow of illegal aliens, including terrorists. But since the Liberal policy is one of open borders (for future votes) they are against almost everything the Conservatives want. Liberals certainly want amnesty for the Dreamers but aren't willing to "compromise" on the rest. Is their room for compromise? You're kidding of course! Conservatives want to repeal and replace Obama Care, but even the Conservatives can't get together on how to do it. Good 'Ole Senator (RINO) McCain, dashed the hopes of an Obama Care repeal and replace with his one NO vote. The Liberals want to keep Obama Care (they created it without a single Republican vote) because it buys them more votes, even if Obama Care is hopelessly flawed, criminally expensive and is increasing the national debt. Who are the losers in this battle of wits, power and the failure to compromise, the American taxpayer? Liberals want to expand Medicaid and Medicare (for votes), further increasing the national debt. Some socialist Liberals are calling for all citizens falling under either Medicare or Medicaid without regard to the cost. Conservatives want to hold back on socialist spending because they know what happens when expenses are greater than revenues. Conservatives have been calling for a balanced budget Amendment. Liberals are opposing it. Will the two sides ever come together? Not likely! Liberals and Conservatives can't even come together on the national debt or deficit. There it is, passing through $20 Trillion on its way to who knows where with no signs of it slowing down. Thirty-eight years ago (1980) William E. Simon, Treasury Secretary under Ronald Reagan, warned us that the national debt would end up sinking the good ship USS America, but the Conservatives and Liberals keep kicking the "can" down the road and spending more for social programs, thereby increasing the national debt. The national debt was under $1 Trillion in 1980. The government is now forced to "print" the money or borrow if from the Federal Reserve and/or foreign countries, like China. The indifference and refusal to act on this crisis by both sides is not just criminal negligence, it borders on high crimes and misdemeanors. Liberals want higher taxes to pay for promises they have made to constituents for their votes and Conservatives want lower taxes for logical imperatives. But compromise? Not on your life! Then there is the environment. The liberals want to make almost every human activity illegal under environmental law. They want to repeal fossil fuels and replace them with alternative energy. Insane! They have become obsessive on the subject of man-caused global warming, even though the science is unsettled. They would deprive us of the greatest source of energy ever discovered by man, based on flawed and inaccurate computer models blaming man for global warming, condemning third-world countries to perpetual poverty. Liberals believe they can replace fossil fuels with wind and solar power, a pipe dream at best and a fraud on the American taxpayer at worst. The Conservatives on the other hand, vehemently oppose these Liberal environmental policies as a means of wealth redistribution, more control over the people and the destruction of property rights. They maintain that these policies are so restrictive and expensive they will put the brakes on the economy, lower our standard of living and could send us reeling into a depression. Is there room for compromise? Hardly! On foreign policy, Liberals are weak and believe in being nice and appeasement, ala Neville Chamberlain. Liberals compromise with our foreign friends and adversaries to the detriment of American interests. Liberals apologize to the rest of the world for America's success. They make give-a-way trade deals, enter into ludicrous agreements and fork over billions of cash to our enemies without extracting concessions, even though those agreements and cash recklessly endanger American national security. Conservatives, instead, play the peace-through-strength card and our friends and enemies respect us. Conservatives build up our military strength and readiness. Conservatives are tougher on trade, call the enemy's bluff and place military assets around the globe to detour overt aggression by foreign empires. There is peace on earth, without world war, because of America's military might. Sadly, most Conservative politicians aren't conservatives any more (RINO'S) and Liberal politicians aren't the old liberals they were back in the 40's and 50's (they are now avowed socialists). Both groups have moved to the left as the Progressives dragged America farther and farther left over the last 8 to 10 decades. As the two sides drift farther apart, compromise becomes not only unlikely, but virtually impossible. Fist fights will eventually break out in the halls of Congress, to be followed by a national civil war. There are millions of Americans who still have the freedom gene buried deep in their DNA and will not sit back and let the socialists win without a fight and fight they will. Meanwhile, older Americans, which we wrote about in our last article entitled "Who Speaks for the Forgotten and Ignored Generation", are fully aware of the two sides failure to compromise. They have had a front row seat for over 60 years. They mourn for their children and grandchildren and what they will face in the coming decades as America sinks deeper into a totally preventable socialist abyss and third-world status ..... Venezuela style. If you are an older American, sickened by what you see happening to your country because your representatives won't do what is good for America and at the same time having difficulty with rapidly advancing technology, perhaps you can find some solace HERE. Ron Ewart is a nationally known author and speaker on freedom and property rights issues and author of his weekly column, "In Defense of Rural America". Ron is the president of the National Association of Rural Landowners (NARLO) (www.narlo.org), a non-profit corporation headquartered in Washington State, acting as an advocate and consultant for urban and rural landowners. An affiliated NARLO website is "Old Timers Resisting High Tech" (http://www.otrht.com). Ron can be reached for comment HERE.